Hoje temos um podcast que fala sobre algumas expressões comuns relacionadas a enfrentar situações difíceis. So a few weeks ago inglesonline reader Camilla wrote in with a request. She said “Why don’t you talk about vocabulary related to difficult situations people go through?” I thought it was a good idea, so.. here it is! And, of course, there are many people who face serious difficulties throughout their lives, one after another. For example, some people are financially poor and have a big family to support, some people lose several family members in a short period of time, others have a serious illness… It’s common to say something like “Sarah has been through a lot”, for example. What does that mean? Sarah has been through a lot. That means Sarah has faced lots of difficulties in her life. She’s still alive, right? So I am not saying “Sarah had difficulties…” in the past, ’cause that would sound like Sarah is dead. I’m speaking in general. She’s still alive so, Sara has had, Sarah has faced lots of difficulties throughout her life. Sarah has been through a lot. She’s been through a lot. And she has probably overcome most of the obstacles or all of the obstacles that she has encountered in her life. So again, we can say “Sarah has been through a lot”. She’s been through a lot. Now, well… some things are not that serious, right? Like falling in public. I think it’s safe to say this has happened to everyone at least once. Maybe you’re walking down the street, minding your own business and then you step on a banana peel, and you slip, and you fall. Has that ever happened to you? I’ve never slipped on a banana peel, but… yes, I have fallen in public a few times. So, last time that happened to you, how did you feel and how did you recover? I did a search on Google and I found a webpage with this question: Have you ever taken a tumble in public? What hurt most: the fall, or your pride? Tumble kinda sounds like Portuguese, right? We say “tombo”, they say tumble. So the question on that page is “Have you ever taken a tumble in public? What hurt most: the fall, or your pride?” Now take a look at this image here to the right. Do you see what this guy’s doing? 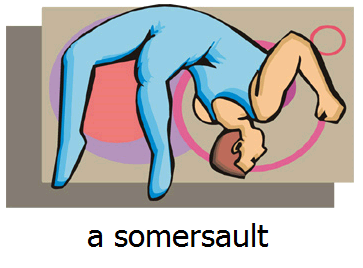 That’s called a somersault, that’s like an acrobatic leap that gymnasts do. Now go to the page and take a look at some of the answers, in particular #15, my favorite. OK, that’s it for today. Have you ever faced serious difficulties in your life? How did you overcome them? Let us know in the comments. Talk to you next time! Hi everyone! Love reading the comments! So I guess most of you have taken a tumble in public once or twice… Join the club! Parabéns, Ana Luiza!! Eu achei o texto muito interessante.Percebe-se que você realmente tenta explicar o assunto do texto da melhor forma possível. Você se esforça para dar explicações precisas e relevantes sobre o conteúdo. O conteúdo proposto acima me ajudou a relacionar coisas do passado até a época vigente. Adorei!!!!!!!!! Muito obrigado por me enviar conteúdos interessantes.Tenha uma ótima semana e que Deus te dê sempre forças para continuar o seu trabalho que,pelo visto está sendo apreciativo por muitas pessoas e por mim. Eu estava dentro do ônibus, o motorista freiou o carro e eu me desequilibrei, daí… caí sentada no colo de um rapaz, mas machuquei meu braço. Now, I take a care with me when I am at the bus. Talking about difficulties situation people go through, makes me remember and i can’t understand how many people can survive with Minimum Wage in Brasil. I think these people are heroes because all we need to eat, to drink and have a good life are very expensive, so many people can’t buy what they need to have a good and a healthful life. God bless their lives and their patience. Oh! I almost forget: I also have fallen in public a few times and what I do everytime… I laught! I think it is a funny situation and there is no other thing to do. This subject is very interesting because what is an difficult situation for somenone probably isn’t for another person. For example, I have a friend that doesn’t like to speak in public. She hates when she has to talk for lots of people. On another hand, I love it! I really like when I have to talk in public about some subject that I really known. Queria Ana, Obrigado pela ajuda de sempre!!! É um prazer receber as informações que envia de forma tão pratica e de simples entendimento! God bless your Life and your dreams!!! Hi, Ana Luiza, glad to see my suggestion here… very nice podcast … Well, I’ve faced difficulties in my life, the last most significant was a disappointment in love and it took me a long time to overcome, but I’m fine now … And taking a tumble in public…definitely yes, like almost everybody, but we need to get it over, right? I do accept as true with all the ideas you have offered to your post. They’re really convincing and will certainly work. Still, the posts are too brief for newbies. May just you please prolong them a little from subsequent time? Thanks for the post. @Maria: I’ve had the same experience as you..
Hey,das ist echt eine tolle Idee. DafÃ¼r stelle ich gerne meine Emiaaldresse zur VerfÃ¼gung. Und wer weiÃŸ, vielleicht ist ja doch noch das eine oder andere dabei, was in den Newsletter vorgestellt wird.Wo kann man denn sehen, wo bereits Geld hingespendet wurde? Thanks God, I’ve never fallen in public in my life, but I’ve seen some people taking a tumble and I have to say, some of that situation are very funny. Talking about difficult situation people go through, makes me remember and wonder how many huge difficulties japanese people have been through after that earthquakes. Excelent! I learn quite well. I ever fell. I twisted my left foot. After of fright I raised, hold my head and continued to walk.